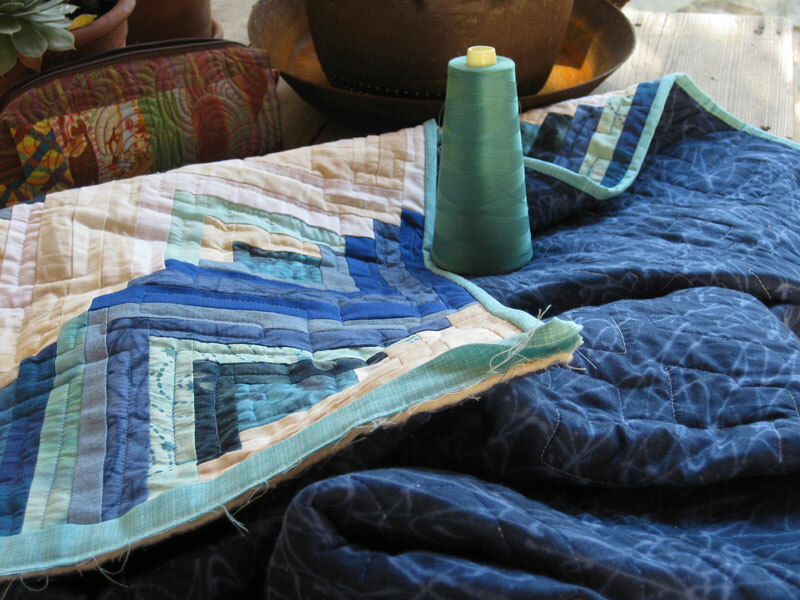 This is the last touch to my blue Log Cabin : I am sewing the border on the reverse side of the quilt as shown HERE. As usual I enjoy this relaxing phase, sewing in the garden with a cup of coffee next. I am linking up today with Kathy for Slow Sunday Stitching. Wishing a wonderful Sunday to everyone! Wonderful blues in your log cabin! 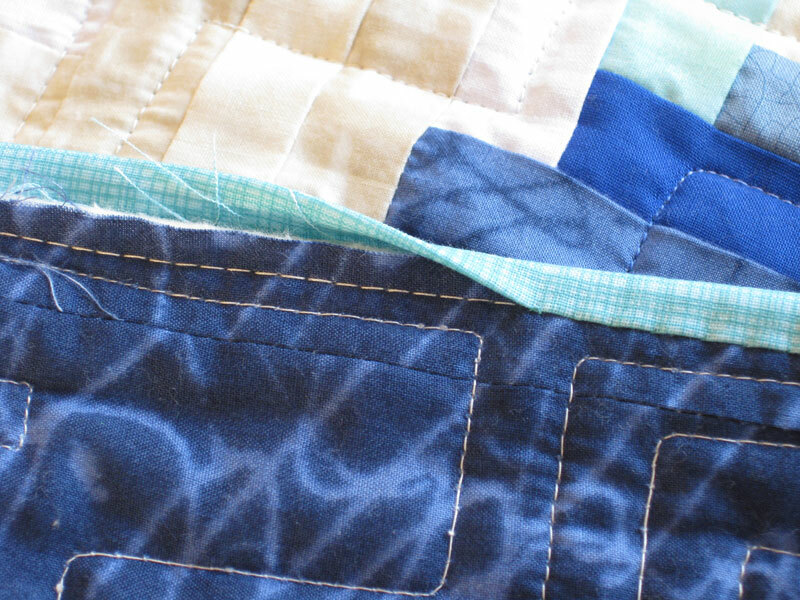 I love stitching the binding down and reflecting the time I spent making the quilt. Enjoy your stitches today! Enjoy, you have a lovely place to stitch and a lovely quilt to stitch on. I spy a super cute little stitching bag as well! Stitching in the garden sounds lovely! Is that a blue and white log cabin quilt? Oh yum ... I love B&W quilts and have made 3 log cabins in B&W (counting the one currently in progress). Enjoy your slow stitching! Enjoy your stitching! It is always nice to put those last few binding stitches in to complete a project. Love the colours you have used for the log cabins too. Lovely quilt and great view, too. That looks like the perfect day! ENJOY! I like your choice of fabric for binding. It looks like you have some gorgeous scenery to enjoy while stitching! Beautiful quilt AND garden! Wish I could pop over and join you for some hand-stitching. Log cabins and blue, two of my favorites. Enjoy your garden stitching. I hope you enjoyed your outside stitching. I was sewing outside today as well. Even though it's a bit cold there won't be many more of these. Oh, yes! That blue binding is super sweet. What a perfect finishing touch! 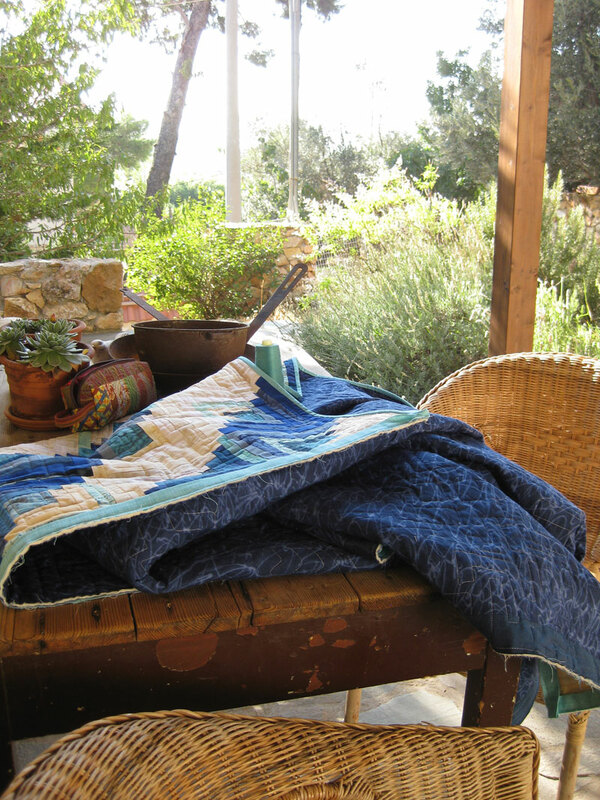 Lovely quilt and a beautiful place to sit and stitch! What could be better?